Update: see our full Amazon MP3 review. The iTunes Music Store has fended off all comers to remain the top digital music store in the world. Now Amazon, with its just-opened MP3 store, aims to knock iTunes off its lofty perch and in doing so may change the future of digital music downloads. Amazon today opened Amazon MP3, its much anticipated storefront for selling music downloads free of digital rights management (DRM). As expected the service utilizes the ubiquitous mp3 format, meaning that music downloaded can be played on any — yes, any — device that supports mp3s, including Apple’s iPod and iPhone, Microsoft’s Zune, and the Creative Zen series of players, as well as most modern cell phones. Although Amazon MP3’s download manager is Mac and Windows-only, so Linux fans are out of luck (Update: Amazon says a Linux version is in the works). Amazon’s DRM-free approach is something that music fans have clamored for ever since digital audio players became popular, but until recently, and for the for the most part, they were stuck with DRM that forced them to use certain players with certain music stores. People are growing increasingly tired of buying DRM’d music from online stores that may or may not be around in a year or two. “Our MP3-only strategy means all the music that customers buy on Amazon is always DRM-free and plays on any device,” Amazon CEO Jeff Bezos said in a statement. Amazon is taking on iTunes mano-a-mano. Music downloaded from Amazon MP3 is encoded at 256 kilobits per second, priced at 89 to 99 cents per track, with 1 million of the 2 million songs available selling at 89 cents. iTunes sells DRM-protected songs at 99 cents and DRM-free songs at $1.29 through iTunes Plus. Amazon is selling complete albums for $5.99 to $9.99; iTunes sells the majority of its albums at $9.99. Amazon MP3’s weakness, at least for the moment, seems to be that only one of the five major labels, EMI, is supplying DRM-free music. EMI, the first major label to offer its catalog DRM-free, also makes its music available to iTunes and other digital music resellers. Universal, BMG, Warner, and Sony have yet to offer a majority of their catalogs DRM-free, something that Apple CEO Steve Jobs has been pursuing for iTunes. “[Amazon’s] arrival in the digital music market will offer even more consumer choice and will be a big advance in addressing the lack of interoperability which has frustrated many music fans,” says EMI’s Eric Nicoli. 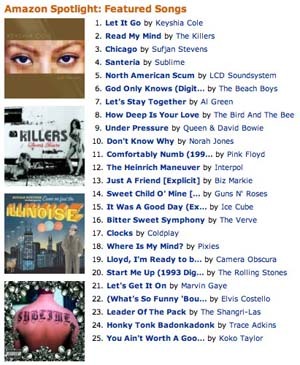 In addition to tracks from EMI, Amazon MP3’s catalog features music from over 12,000 independent labels. There has been lots of DRM action lately, made possible in part by EMI’s decision to offer its tracks DRM-free. And while DRM-free music is also available from a number of stores including 7Digital, eMusic, Limewire, and Wal-Mart, as previously noted when rumors first surfaced, Amazom’s clout should help pile on more pressure for the other major record labels to follow suit and embrace the mp3 format. Also: Over at our sister blog, Read/WriteWeb, Marshall Kirkpatrick took Amazon MP3 for a quick spin, and was impressed. iTunes overtakes Best Buy to become No.2 music retailer in U.S.